“Nothing in the world is more dangerous than a sincere ignorance and conscientious stupidity.” This statement was made by one of the finest human beings, in my humble opinion anyway, that ever graced the American Republic. They were made by a person of high ideals and infinite wisdom. A person with a vision of what this great nation of ours could achieve if we could just come together as a people. That person was Dr. Martin Luther King, Jr.
Conservative Americans that we are, we have long lived with our heads down in the sand, or up our, “you know what’s” when it came to the political arena. We happily went through our days, worrying about only those things that pertained to our own little worlds and not much that had to do with political theater. Those days are past now. Our days of sincere ignorance were burned upon the altar of that amazing piece of political theater that was the Barack Hussein Obama Greek Parthenon inauguration set. There had been a deep disappointment in our political leaders before President Obama. Conservatives had become fed up with the politics as usual and out of control spending that President George W. Bush’s term had become. The biggest difference and the one that brought us out of our stupor was then, Senator Obama’s deep held belief that we, you and I, conservatives and Republicans in general, were the problem. We saw his disdain for the America that we grew up in. We saw that he had a vision, a vision not like Dr. King's where we all would live in freedom, where we all would put aside race and live together as humans. Equal under the law and under the eyes of God with equal opportunity to achieve and succeed. No, Barack Obama has a vision where all Americans will be equal in their final outcome. He envisions a nation where those that work and strive for success pay for those that don’t. He envisions where all of the wrongs perpetrated on the entire rest of the world’s people by Anglo Americans will be righted. Righted by his Presidency. Righted by him. Damn the rest of us. Dr. King also once stated, “We must accept finite disappointment, but never lose infinite hope.” Conservatives can never lose hope that they will stop the downward spiral that our Republic is on. That we can save the American way of life that we and our ancestors enjoyed. Very few of us have been or will ever be rich, but we all have the opportunity to aspire to achieve that end for ourselves and for our families. 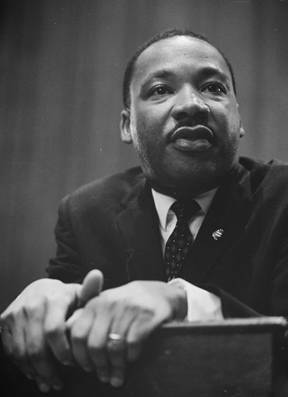 “There can be no deep disappointment where there is not deep love.” Once again quoting Dr. Martin Luther King, Jr. The disappointment we conservatives, we working Americans, we America loving Patriots and most importantly, we voting block of conservative and legal voters have in the GOP is staggering. If the establishment of the Republican Party would see and would care about our beliefs and feelings, it would shock them into returning to its conservative ways. Conservative disappointment in the GOP is tempered only by the fact that the Democratic Party is such a pariah upon the working citizen’s money and freedom that conservatives have no where else to turn. No where else except to the GOP that they know will disappoint them at every opportunity. A supreme case in point being this latest 2011 budget deal made by Speaker Boehner. A promised $100 billion became $64 billion which became $38 billion which is now, the light of the day actually $352 million. Conservatives have supported the Republican Party well beyond the love that the party returns to them. Their love of the party is waxing colder by the day toward the establishment GOP and may soon turn toward another. Speaker Boehner, the outcome of the next election is in your hands. The conservatives in this nation are looking for a leader that leads. They are not looking for a leader that tries to perpetrate a hoax on them by slight of budgetary hand. The conservatives of this nation are going to vote for someone that tells them the truth and stands by their values. Be that a Republican such as Romney or an Independent such as Trump. It would do the GOP well to remember that Ross Perot received in 1992, 18.9% of the votes and cost the GOP the election. Not just once, but twice. Again in 1996. “The ultimate tragedy is not the oppression and cruelty by the bad people but the silence over that by the good people.” Dr. King once more. Conservatives have looked to the GOP to stem the tide of the Democrats social-Democracy slide toward European socialism. Republicans, when forced by their voters have stuck their legs out to trip up the Progressives in their race toward an integrated world financial, social and governmental system. But only when they had to. Conservatives believe that, as in the past, equal outcome provided by a centralized and heavy handed federal government is in itself an oppression and cruelty by a bad people. The silence of the GOP is deafening to conservatives. Where are the Republican establishment voices crying for our freedoms? U.S. Senator Lindsey Graham (R-South Carolina) saying that, “elections have consequences”, parroting President Obama, and giving in on just about everything does not endear the conservative to the GOP. The American people, the conservatives in this great Republic still have hope. Not so much for the GOP to find its way but for the American people to right the direction that our nation is headed. They have hope for a better day ahead. They have hope that our sins of the past will now get behind us and that the struggle we are engaged in now will somehow work out and make us a stronger, a better and a freer republic. Conservatives will not lose hope. They will not give in. “If you lose hope, somehow you lose the vitality that keeps life moving, you lose that courage to be, that quality that helps you go on in spite of it all. And so today I still have a dream.” Dr. Martin Luther King, Jr. He was a man that was a great American. Now, go out and be a great American yourself. The Real Facts! Look up the data! Ross Perot and 1992. Easterbook argues that George H.W. Bush lost because the Texas billionaire "siphoned off conservative votes." False.